Let me begin with this disclaimer: I don’t usually read Asian immigrant memoirs. At least, not until very recently. 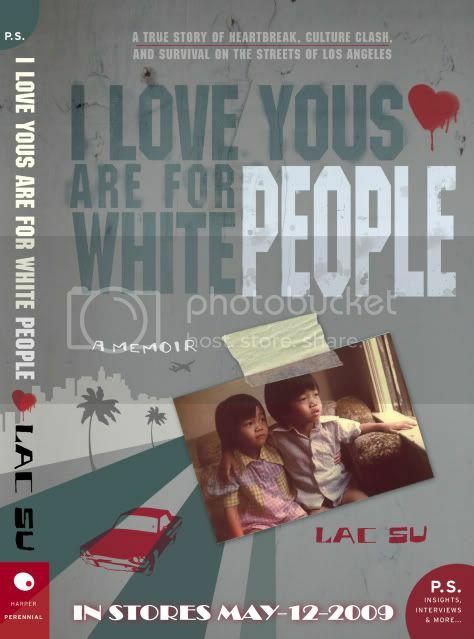 This particular book came to my attention while I was randomly perusing some Asian American culture blogs, where it had received some attention, in part I’m assuming, because of its provocative title. The reason I wanted to put out this disclaimer up front is because, unlike a lot of other reviews for this book available on the web, this one is not written with an academic background in ethnic studies or extensive experience with the canon of the Asian American memoir. So, what can my review offer? Well, as the child of Asian immigrants who had never read Asian immigrant memoirs until very recently, I found the experience of reading this particular memoir and studying the blogosphere’s response to it to be interesting because of the questions it raised for me as an ethnic person in contemporary America who occasionally writes things for public consumption (Exhibit A: this blog post). So, in addition to sharing my thoughts on the book, I’m going to share some thoughts on the responses it has elicited, which I have found to be equally interesting. While there were a lot of interesting and amusing moments in the memoir, of particular interest to me was the prevalence of violence throughout. I got the impression that for Su and his family, violence was encoded in their family’s story from the get-go. From the boat-dock escape amidst machine gun fire at the beginning, to the brushes with street violence sprinkled throughout, Su’s family just couldn’t get a break. For me, the most riveting scene in the book was a scene of random violence in which street thugs attack Su’s father while he tries to bike to work; the ostensible leader of the gang pins Su’s father on the ground and attempts to shove a screwdriver into his throat (Su’s father avoids serious harm by turning his head to the side in the nick of time). In addition to depictions of random violence like this, there are countless scenes of domestic violence in which Su’s volatile and overbearing father punches, whips, slaps, or uppercuts everything and everyone in sight, including his wife and children. Then, in the latter half of the memoir, Su recounts incidents of gang violence in which he engages in hand-to-hand combat with other local street toughs. Cumulatively, it comes across as one big olio of dominance rituals and tribalism.